I stopped by a local Mistubishi dealership last night. Yes, unlike unicorns, they do exist. 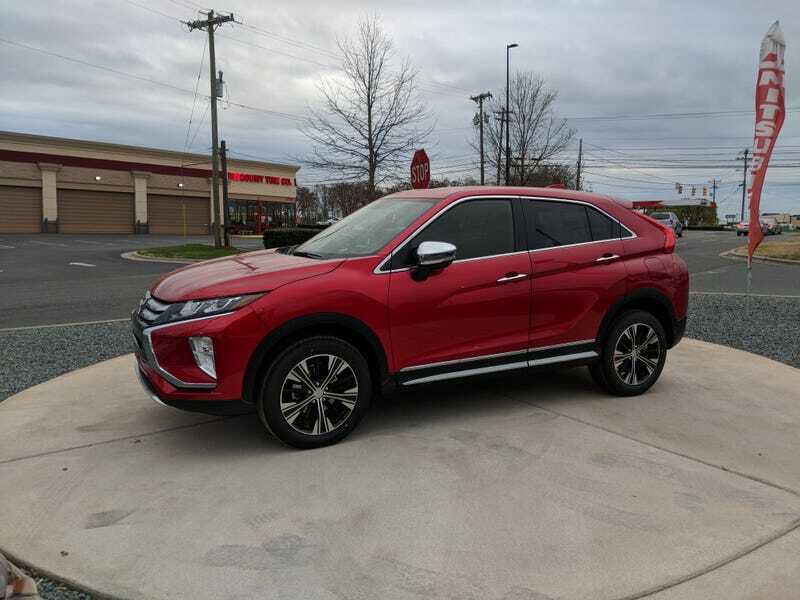 I have seen no published reviews of the unfortunately named Eclipse Cross, so I decided to have a look. I had high hopes. Higher than I should have. It wasn’t bad. However, may be over priced for the targeted segment. Exterior wise, in person, the pictures simply don’t do it justice. It’s not beautiful, however, it is a good looking, well proportioned vehicle from most angles. Dead on side view is a tough pill to swallow. The details seem nice and the overall build quality seems consistent with even panel gaps. I was told by the incredibly laid back manager that the Eclipse Cross is targeting the Nissan Rogue. Not the Rogue Sport. The Rogue. This is where I start to have some problems. The Rogue, much like my Equinox, play in the compact CUV class. Generous cargo, sizeable back seat space and good-ish width are all reasonably expected. The cargo space behind the rear seats in the Eclipse Cross is decent, however, hindered by the form over function C-pillar. With the seats folded, it’s bigger, however, the tail-gate opening is small-ish and oddly shaped. The seats also do not fold completely flat. The cargo area is comparable in size to a Chevrolet Trax more than an Equinox or a Rogue. The rear seat moves forward and back to give more cargo or rear seat room accordingly. However, both areas are compromised no matter what position is chosen. The floor seems high and the seating position for this 5-8 (with good shoes) man felt cramped. Seats were comfortably padded. I wasn’t able to snap any pictures of the front seat area, however, things don’t improve much size wise there either. The build and material quality were good for the segment (subcompact-compact). Panel gaps at the dash/door were tight compared to my Equinox and it felt well screwed together. However, I couldn’t shake the feeling that this thing was more of a subcompact than a compact CUV. Switch gear felt good and overall was intuitive to use. I didn’t play much with the touch pad. I hate them. I think they require much more distraction to use. The Eclipse Cross I drove was heavy on content and had standard all wheel drive (26 mpg highway!) Which, felt disappointing. I am averaging a tick over 34 in my significantly larger Equinox. However, my Equinox is front wheel drive. A comparable AWD Trax is rated at 30 MPG. I understand the added weight can make a big difference. The issue here is the Eclipse Cross isn’t offered without AWD unless you take the base trim. Overall, the Eclipse Cross drove well. It felt composed and rather athletic. Power delivery was smooth but not very hurried. The motor gives off a feeling of haste in the seat of the pants which was pleasant. The CVT seemed to neuter it’s overall athleticism. The Eclipse Cross is a seemingly well crafted and is packed with technology and equipment. However, at this model’s as tested price of over $28k, I hope there are significant discounts to be had. A Rogue competitor this is not. This Eclipse Cross felt like a tweener car. Which, with the right cost strategy, should do well in the current SUV crazed climate. It’s stylish, comfortable, tech laden and drives well. The only hindrance I see is the packaging and the fuel economy.